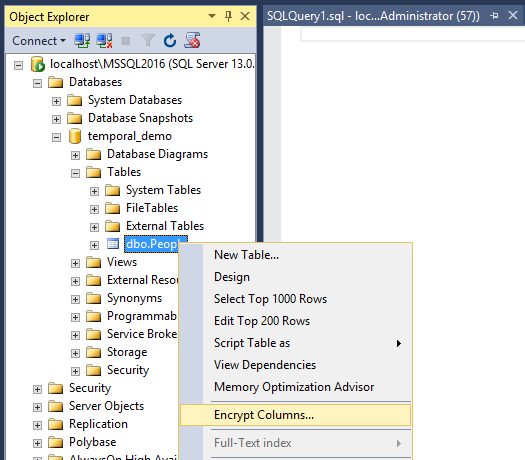 Among the overwhelming amount of new features available for SQL Server 2016, there was one I really wanted to try, maybe because I have never worked with encryption further than hashing passwords for a website. This feature is, you name it: Always Encrypted. 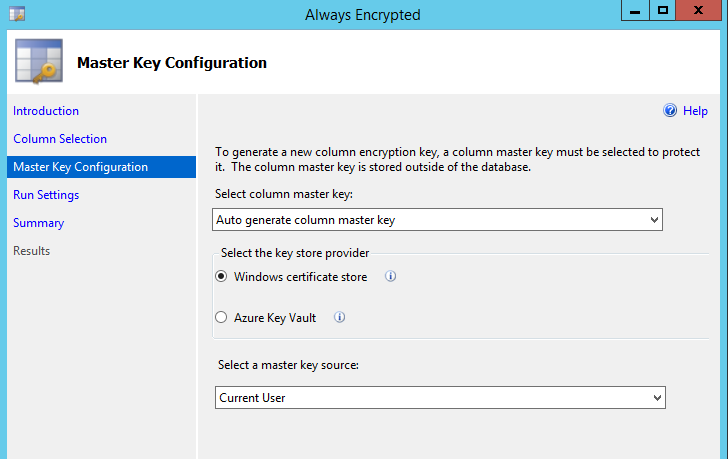 *Note that BOL is wrong and both, column master keys and column encryption keys can be created using T-SQL. The easiest way to configure Always Encrypted is using the wizard so for the shake of simplicity, that is my first shot, but with such bad luck that I tried with a temporal table. Again the wall. 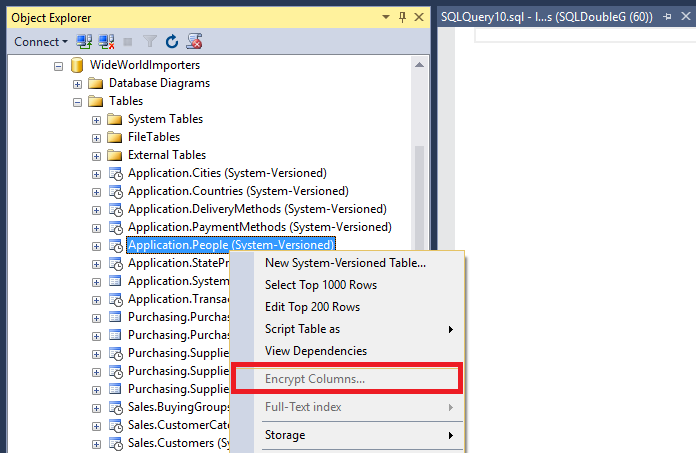 There is no way you can choose a temporal table and apply encryption to a column or columns using the wizard. I tried then using the powershell (after manually creating the keys) as this is true the only way to encrypt existing columns, just in case. 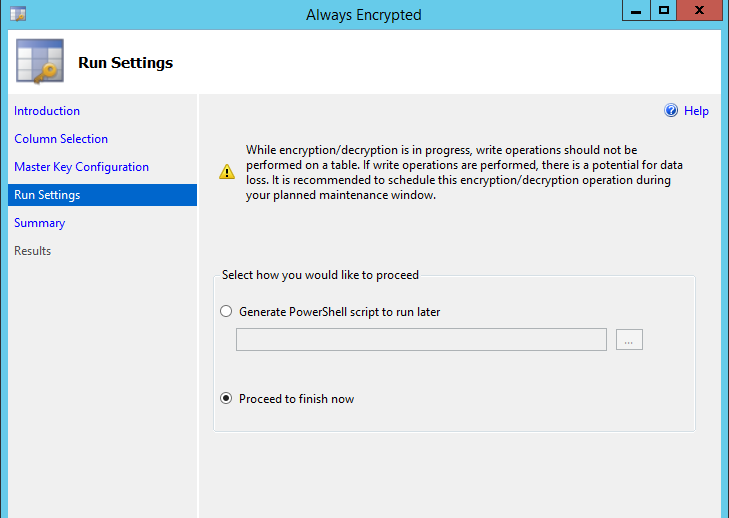 System-versioned temporal tables with always encrypted columns are not supported. Now it’s when my brain started boiling trying to find a way to make it work, because how nice would it be to be able to track changes regardless the data is encrypted or not. I know it’s kind of weird, but SQL is not maths and sometimes this happens. If I cannot encrypt columns in a temporal table, can I make temporal a table that contains encrypted columns? Let’s see… First I’ll create a table and put some data, then we’ll encrypt a column. The table we just created looks very similar to a temporal table, but as you can see, it’s not. This point is important, because we need to create our table with a similar structure as it was temporal to be able to convert it later on. Now we can try encrypt a column from our table to see what happens. See how now the option is available, so we can proceed to encrypt our column. Just a few clicks later when we have finished the process, we can see how our data is actually encrypted. You can observe how the data in the [HashedPassword] column is now encrypted. The next step is to get the table with the encrypted column to hold historical changes as temporal tables do, so we have to ALTER TABLE as explained in BOL. Remember we have the table ready with ROW START, ROW END and PERIOD FOR SYSTEM TIME, so the only we need to do now is to convert it. You can see how there is no problems at all and both features work together as we were expecting. There is a big caveat though. Once you have started this way, you won’t be able to encrypt any pre existing data as it will fail due to these two features “incompatibility”. You can create new tables with encrypted columns and dump your existing data there, and it will work, but existing data won’t be encrypted. Just to wrap up let’s see what is allowed and what is not. I can imagine why this two features work together when you build temporal on top of encrypted and not vice versa, but I’m happy I found the way to workaround it. So far I found these caveats explained above, but if you see any other, please feel free to tell me and I’ll update this post. I really look forward to your comments and keep investigating more about these awesome features. Thanks for the article and bringing this issue up. I’m part of the SQL Server product team. 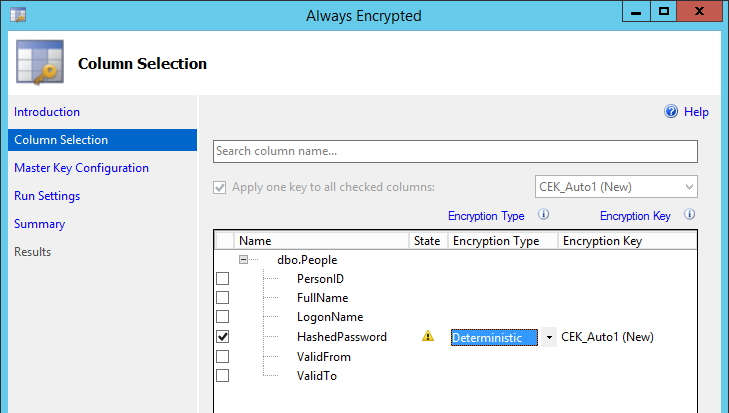 The database engine in SQL Server 2016 supports Always Encrypted in temporal tables, but SQL tools (SSMS, PowerShell, DAC Framework) do not currently support encrypting/decrypting columns in temporal tables. We are actively working on enabling that in one of the upcoming monthly releases of SQL tools. 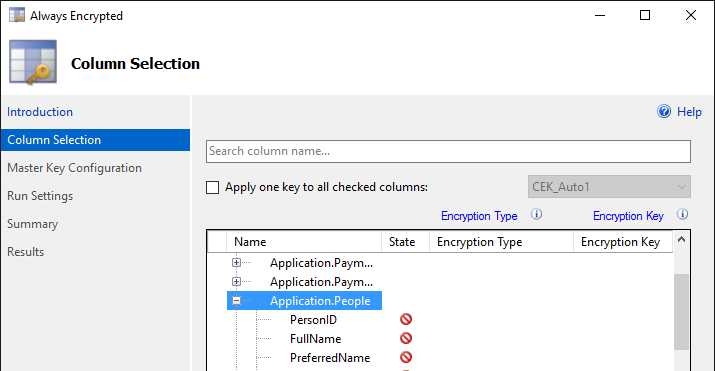 Also, on your comment that “column master keys and column encryption keys can be created using T-SQL”, I’d like to clarify that T-SQL only supports creating key metadata. The full process of provisioning the keys also involves creating the actual (physical) keys, which is not supported in T-SQL that is what we meant in the document. We will try to make it clearer. Thanks for your feedback. Thanks Jakub for your comment, it does shed some light there. Since these 2 are new features for 2016, I guess it’s just a matter of planning and applying both in the order that now works (in new developments) but it’s great to know you’re working on it! Thanks again and cheers for the SQL team[s]! This two new features are really awesome! Thanks for sharing! Thanks for your comment. Yes querying the temporal table will decrypt both, the current data plus the archived data. You can see the last query uses FOR SYSTEM_TIME ALL works but shows obviously encrypted values. But if you modify your connection string to use “Column Encryption Setting=enabled” you’ll see how all values are decrypted.